An interacting galaxy duo. 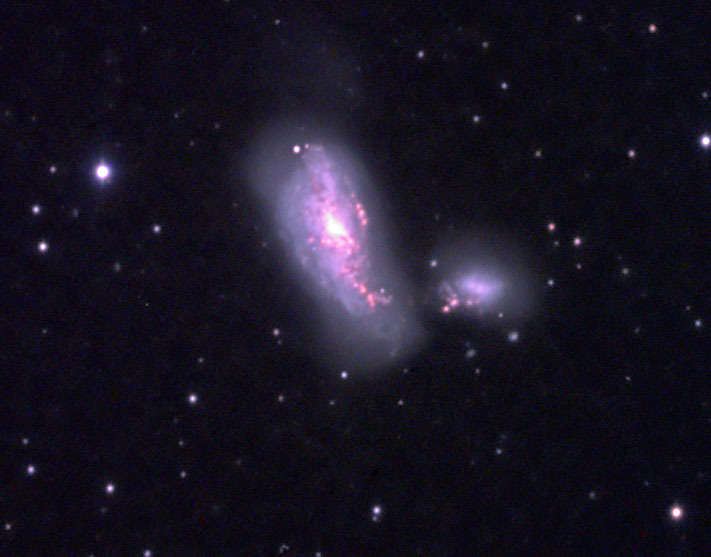 NGC 4485 is the smaller galaxy. Approximately 40-50 million years ago the two galaxies passed very close to or through each other causing a warping of each. It is believed they were both typical spiral galaxies prior to the encounter. They are now about 24,000 light years apart but are still connected by a trail of stars. Note the extensive HII regions where active star formation is occurring. NGC 4490 is an intense infrared source. Note the halo of faint stars surrounding NGC 4490, the halo is identified as LEDA 89542.